I found some beautiful eggplants at the market this week and thought of this salad, a staple we ate all last summer long. Summers already nearly over, which is hard to believe, how fast the time goes and goes, but this salad feels like summer on a plate that we can enjoy all the way through the fall. Roasted eggplant and chickpeas, lots of fresh herbs – parsley, mint & oregano – tomatoes, currants, a squeeze of lemon and some toasted quinoa or millet added in for a little crunch. Think of it as a wildly embellished taboulli – yum. Last summer I would stir in some soft goat cheese, which adds a nice creaminess, but this time around I left it out since I’m eating dairy free at the moment. Every bit as delicious without the cheese, but you could also stir in some dairy free chevre style nut cheese if you like (I’ve been enjoying Heidi Ho ne chevre lately), for a little something extra if you’re vegan or dairy free. Your choice, stir in some goat cheese, a little feta, dairy free nut cheese or leave it out, we’re happy to eat it either way. For us this makes a meal in itself served atop a bed of quinoa and some arugula or other salad greens lightly dressed, Romaine works great too. I also like wrapping it up in a large chard leaf, again Romaine or collard greens would also be very suitable with a little bit of hummus or a spread of roasted eggplant & tahini helps keep it all stuck together in the green wrap. Or make this part of a middle eastern style assorted salad plate with some stuffed grape leaves, hummus, muhammara (find my gluten free version here), a few olives and a side of lavash or gluten free crackers. Last night after dinner, Skyler announced this tasty salad to be in my top ten of savory recipes, and even though she’s definitely my biggest food fan and dining ally, I think that’s a pretty nice endorsement. This roasted eggplant, chickpea and fresh herb salad is delicious and keeps well for several days, easy to make ahead and bring to a party or keep leftovers parked in the fridge to snack on or add to lunches throughout the week. Enjoy! I love roasting vegetables and do so regularly. It’s amazing what a little olive oil, salt & heat can do to elevate a simple vegetable to something complex and sweet. I’ve been roasting cauliflower for years and loving it. But I recently starting doing it just a little differently and I’m forever changed. The secret is to cut the whole head into slices rather than breaking it up into florets. Slicing the cauliflower allows more of the surface to come in contact with the roasting pan and leads to perfectly roasted carmelization. The chick peas complete the dish, elevating it beyond a simple plate of vegetables. When roasted the chick peas develop a beautifully crisp exterior while maintaining their creamy interior. It’s so simple, yet so delicious. Prepare 1 or 2 large rimmed sheet pans by drizzling them with Olive Oil. Wash the Cauliflower and remove any leaves. On a large cutting board, first cut the Cauliflower in half and then cut each half into approximately half inch slices. You can leave the slices large or break them up into bite size pieces if you prefer. 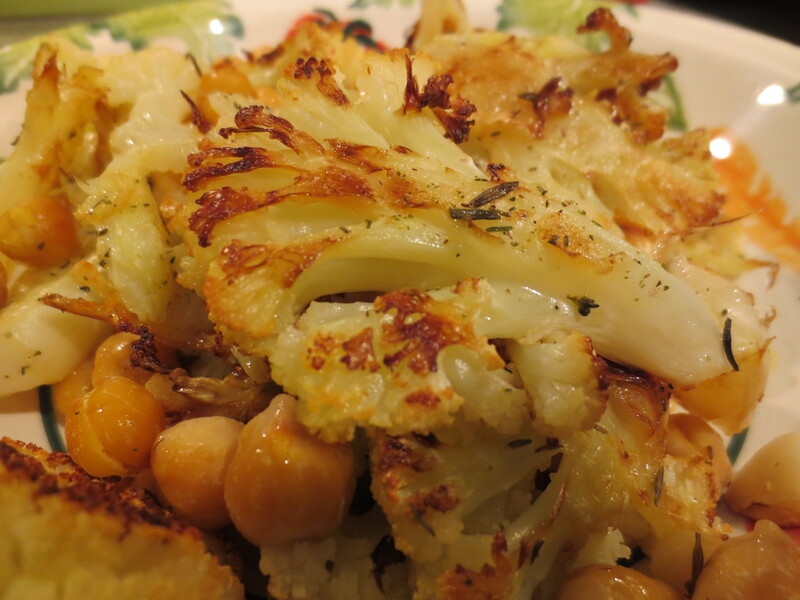 Lay each slice of Cauliflower on the rimmed baking sheets and turn them over in the olive oil. Chop the Garlic in large pieces, about 4-6 pieces per clove depending on the size of your cloves. Top the Cauliflower with the chopped Garlic. Sprinkle with Salt and Thyme. Drizzle with a little more Olive Oil. At this point you can either add the drained Chick Peas to the pan with the Cauliflower or if you prefer hold off and add the Chick Peas at the half way point. Note: Cooking the Chick Peas for the entire time will yield a crunchier but also slightly drier result. If you choose to add the Chick Peas at the half way point, they won’t be quite as crisp, but still absolutely delicious. Position pans in the lower third of the oven and bake for about 20-25 minutes, then flip the Cauliflower and Chick Peas over or add the Chick Peas to the pan at this point if you didn’t already. Bake another 15 minutes more on the second side. If using 2 pans rotate their positions in the oven when you flip the Cauliflower. The pan towards the center of the oven may take a little bit longer to cook than the pan in the lower part. 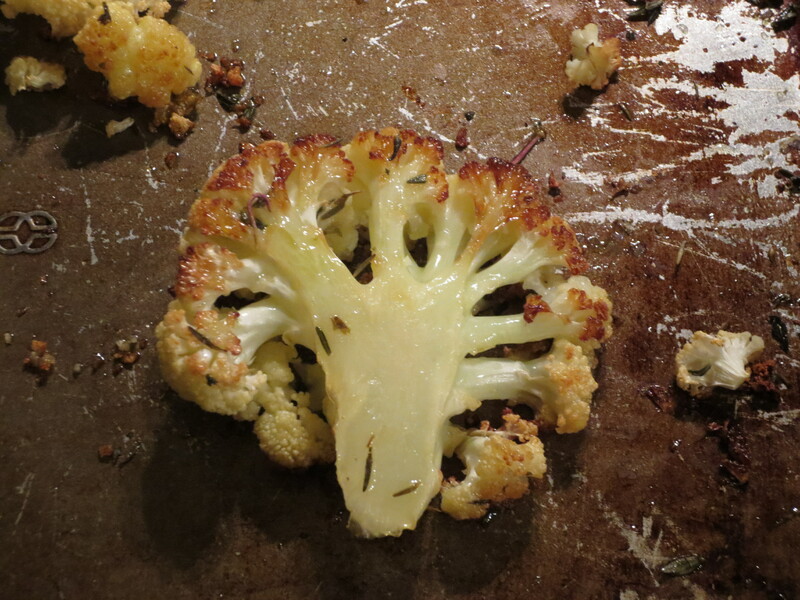 The Cauliflower should develop a beautiful golden carmelized color. Remove from pan with a spatula (or eat right off the pan as we often do in our house) and Enjoy! 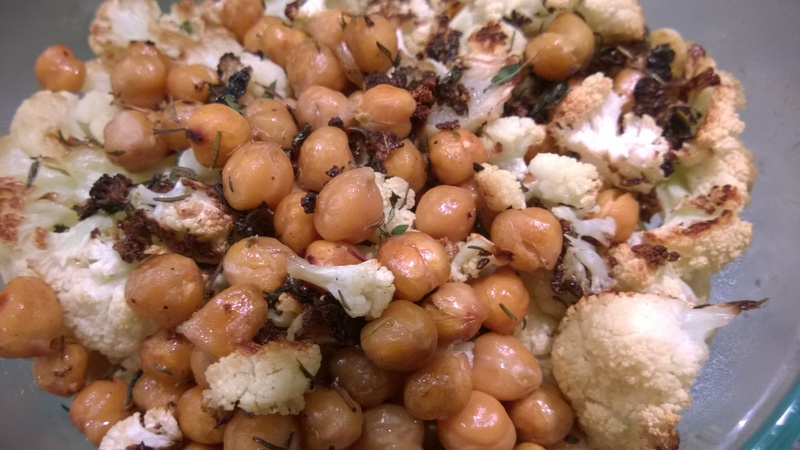 Recipe Notes: Roasted Chick Peas and Cauliflower are a great accompaniment to any main dish. We like them tossed with pasta or as a side with Quinoa Fritters or even with Tabbouleh.